Until August 12th, President Donald Trump’s Twitter feed showed a predictable obsession with the big issues swirling around his presidency. Tweets ranged from disgraced FBI agent Peter Strzok (“and his lover, the lovely Lisa Page”), Mexico trade (“the new president has been an absolute gentleman. Canada must wait”), and Omarosa (“got fired three times on The Apprentice”). Then on Sunday, only four tweets made the cut. One of them caught Trump watchers by surprise, even for those who have come to expect the unexpected. 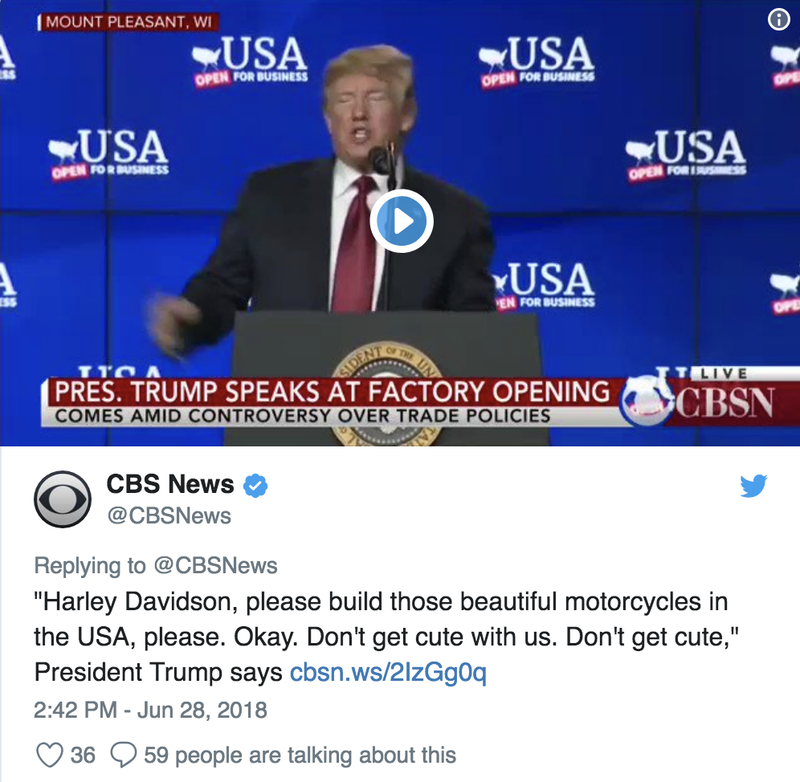 It was tweeted at 5:57 in the morning, and aimed at Harley-Davidson CEO Matthew Levatich’s plan to open a manufacturing facility in Thailand. The tweet wasn’t random. Trump has been on the warpath over moving jobs overseas since he took office. But when the news came out of a company that is both an American icon and one that he had feted at the White House, and from the state that gave him the election, it rose to Twitter DEFCON level one. Another audience was listening to Trump, and an unusual one at that. According to USA Today, labor union rank and file was joined by their leadership in supporting the president: “The union is critical of Harley for investing in Thailand…These companies are taking tax breaks with one hand and handing out pink slips with the other. ‘I’m going to call it like I see it … this is a corporate ambush on working people,’” said International Association of Machinists and Aerospace Workers President Bob Martinez, Jr. When Trump sings the same tune as labor, it’s time for a company to get out of the way. But Harley wasn’t listening. 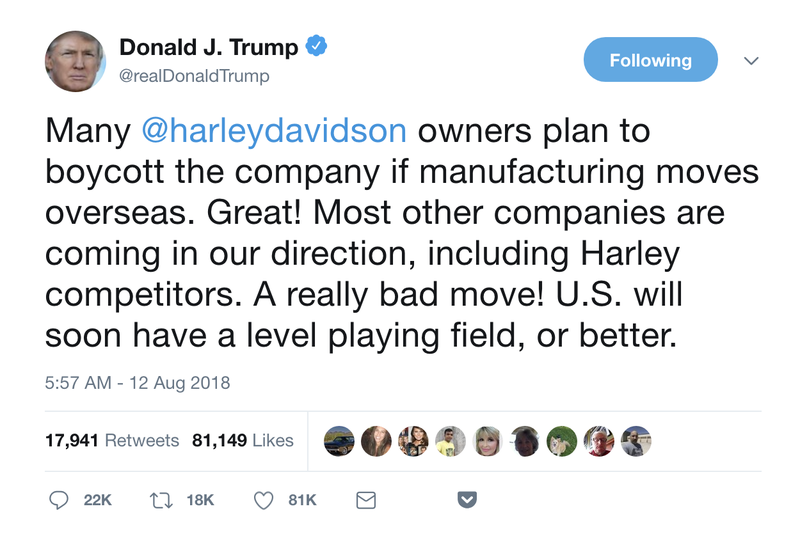 The response out of Harley-Davidson sounded like like a globalist chant by 90’s era neocons, “Increasing production capacity in Asia is consistent with the company’s long-term strategy to focus on growth internationally.” Strategically correct, but in election terms, a non-starter. The majority of Americans do not own a passport, speak a foreign language or travel abroad, so geopolitical arguments tend to get fuzzy quickly. What many Americans do understand, and certainly the president’s countrymen take to heart, is that closing down 800 jobs in Kansas City, the one location that says ‘heartland’ while moving to a new facility in Thailand, isn’t going to play in Peoria. The obvious calculation driving this argument is that the president faces a tough election in November and a good deal of the friction will be on trade. He is a man who desperately loves to win, has done so all his life, and will go to great lengths to make this happen. In order to prevail in November, he needs a streak of wins to get the political capital that he can spend on Congressional races across the country during a historically tough mid-term election. Then he will have the luxury of time to tackle the trade issue without the toxic populism, or at least some of us hope. Trump also has more than trade on his mind, as anyone following Robert Mueller’s investigation can confirm. Holding onto a Congressional majority may be a matter of job security for a president who is looking at an avalanche of investigations and even impeachment proceedings should his party lose. If a company walks into the middle of this minefield, they need the clout of Apple Computer, or a profile so low no one will care. Harley Davidson fits neither description. And the logic of their economic argument is out of place in this environment. When a company counters the president’s bargaining power, they are no longer playing small ball. Harley Davidson sports a $7 billion market cap, which is not far from the market value of the four startup electric e-scooter makers (check them out at MyProScooter). This suggests Harley has a real problem with changing demographics in this country, and that is driving their overseas ambitions. We get that. But staying quiet, maintaining a low profile, and having a tête-à-tête with the president would be the more sensible move, rather than relying on a globalism rebuttal during a tough election year. While the duty to shareholders very much includes building a manufacturing facility in Thailand, the how, when, and why should be more carefully constructed. This is a president who enjoys negotiating over private dinners or golf at one of his resorts. Why not take that approach? If Harley wants to figure out how to make Thailand work, they should remember that the president owns the Trump International Casino in Bangkok. He will probably offer some good advice and even could put Matthew Levatich up for a stay at his hotel.